Before and after pics on Suspension Lowering. Notice the difference in the riders ability to comfortably contact the ground. This enables the rider to balance the bike which makes for safer stops and instills confidence. Lowering can be required for a number of reasons. Touching the ground and geometry changes are the two main ones. We have been lowering suspension for over 25 years. In some cases it is as simple as the addition of special spacers in both the forks and shock. In other cases it is quite involved including changing or modifying springs and custom machining. 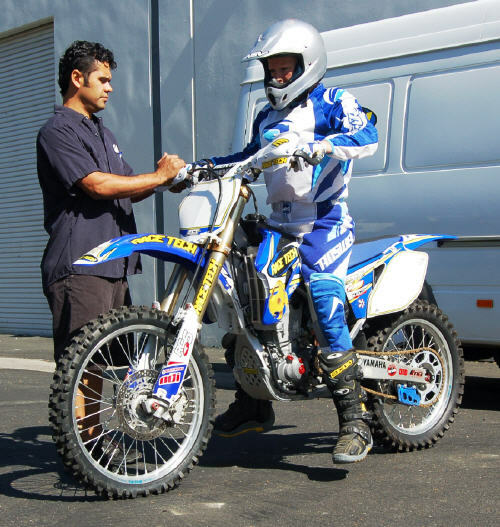 We can lower your suspension whether it's Street, Dirt or ATV. 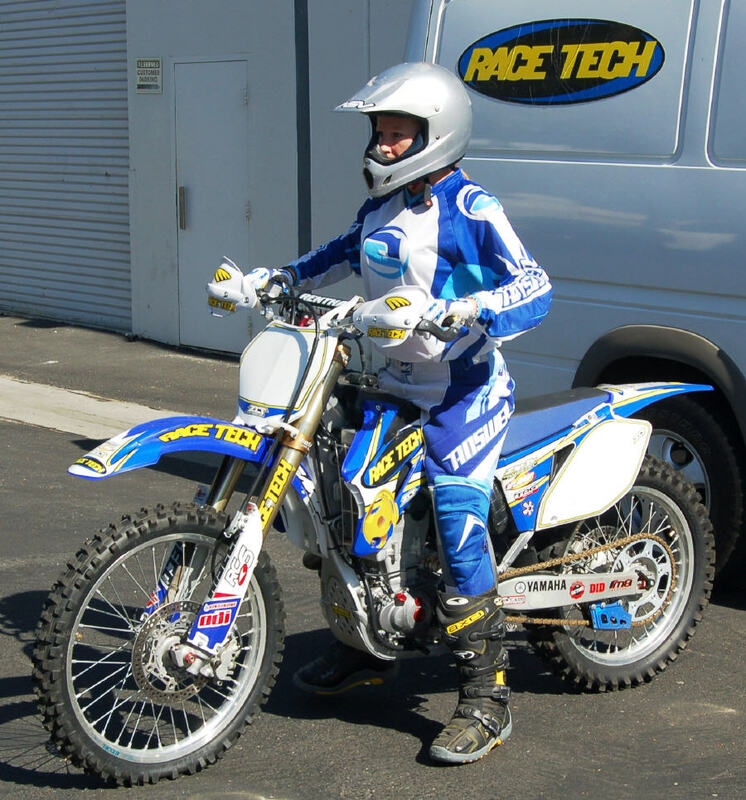 Race Tech offers Suspension Lowering for all rebuildable suspension. Note: some models are not rebuildable. Check our Product Search. This is more of a problem on the rear. In this case we may be able to build custom G3-S Series Shocks for you. In general when lowering a motorcycle, both the front and rear end should be lowered the same amount. We have Scheibner Mega-M.A.X. Chassis Analysis services available to check for proper geometry and chassis alignment. 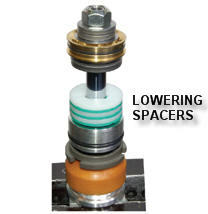 Shorter springs may be required for the reduced length of the forks and shock. This may be accomplished by modifying the stock springs or by replacement with a RT HP Spring or even with a modified RT HP Spring. When a spring is shortened it becomes stiffer. When modifying the stock springs this may or may not be beneficial. This will be determined on a specific application basis. We may need to see your shock and forks to find out. We strongly recommend suspension be revalved for reduced travel with our Gold Valves during this process. This will set the valving properly for the decreased travel, for your riding weight, ability, and type of riding. When the rear end is lowered the travel starts deeper into the leverage ratio curve and this affects setup. F450 Moto Conversions require both lowering and bottoming point changes. This means the bottom-out bumper is shortened and moved as well. The spring rates are radically changed and the geometry is setup. Please check out our F450 section for details. Another solution for gaining inseam clearance is shortening and/or recontouring the seat. We have found a quatlity company that can perform these modifications to your stock seat at very reasonable prices. Feel free to contact Josh Geraurd at 951-279-6655 ext. 110 or JGeraurd@yahoo.com or call him directly at 909-645-0834. Pics of seat recontouring. Pricing starts at around $225 for Forks and $215 for the Shock ($440 for both), this includes rebuild and oil and lowering spacers only. Any extra parts, springs, or custom modification including machining is extra. Please call for specific pricing 951.279.6655. Please recognize that we will have to see some models before we can give exact pricing.